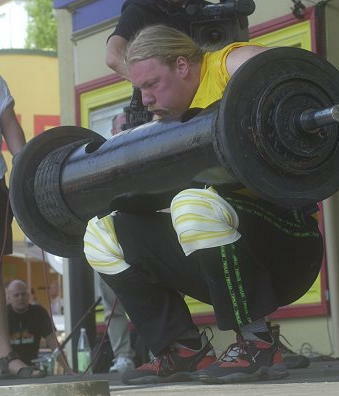 Torbjörn Samuelsson, from Sweden, was Sweden's Strongest Man in 2002. He is also the brother of former World's Strongest Man Magnus Samuelsson (1998). Torbjörn Samuelsson has made 3 appearances at the Worlds Strongest Man contest in 2000, 2001, and 2002. He never managed to make it to the finals. Some of his other acheivments are several 2nd and 3rd place finishes at Sweden's Strongest Man and two 1st place finishes at the same contest in 2002. He has also been the sweish Arm Wrestling Champion. One of Torbjörn's best events is the loglift. He has pressed over a 160kg overhead and at onetime co-held the Swedish loglift record with his brother Magnus at 160kg. 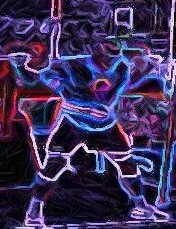 He also does well at events that require excellent grip strength such as hercules holds and farmers walks. Torbjörn comes from a farming background which probably contributed to his great strength. In his spare time he races cars in Sweden.